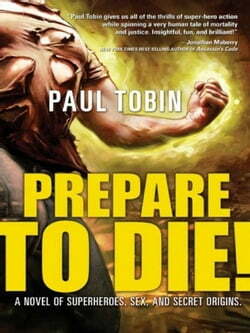 Home > eBooks > Fiction > Fantasy > Contemporary > Prepare to Die! Nine years ago, Steve Clarke was just a teenage boy in love with the girl of his dreams. Then a freak chemical spill transformed him into Reaver, the man whose super-powerful fists can literally take a year off a bad guy's life. Days ago, he found himself at the mercy of his arch-nemesis Octagon and... read more a whole crew of fiendish super-villains, who gave him two weeks to settle his affairs-and prepare to die. Now, after years of extraordinary adventures and crushing tragedies, the world's greatest hero is returning to where it all began in search of the boy he once was . . . and the girl he never forgot. Exciting, scandalous, and ultimately moving, Prepare to Die! is a unique new look at the last days of a legend.